Director – Mikael Salomon, Teleplay – Peter Filardi, Based on the Novel by Stephen King, Producer – Brett Popplewell, Photography – Ben Nott, Music – Christopher Gordon, Vocals – Lisa Gerrard, Visual Effects – Universal Production Partners (Supervisors – Jan Malir & David Vana), Special Effects Supervisor – Clint Ingram, Production Design – Leslie T. Binns. Production Company – The Wolper Organization/Warner Bros. Television. In Detroit, a homeless man attacks a priest at a food bank and they both fall out of a window. In hospital, the injured homeless man tells a doctor his story. He is writer Ben Mears. Mears returned to his hometown of Jerusalem’s Lot in Maine, intending to write a book that exorcised his fears about the things he witnessed as a child in the gloomy, supposedly haunted Marsten House that overlooks the town. Ben found that the Marsten House had been rented by another new arrival in town – the antique dealer Richard Straker and his reclusive business partner Kurt Barlow. Suddenly, people began dying all over town. Not long after they died, the townspeople then began coming back from the dead. Ben, schoolteacher Matt Burke, Ben’s romantic interest Susan Norton, young Mark Petrie, doctor James Cody and the local priest Father Callahan came together, realising that they were dealing with a plague of vampires. ‘Salem’s Lot is a remake of the Stephen King novel Salem’s Lot (1975). 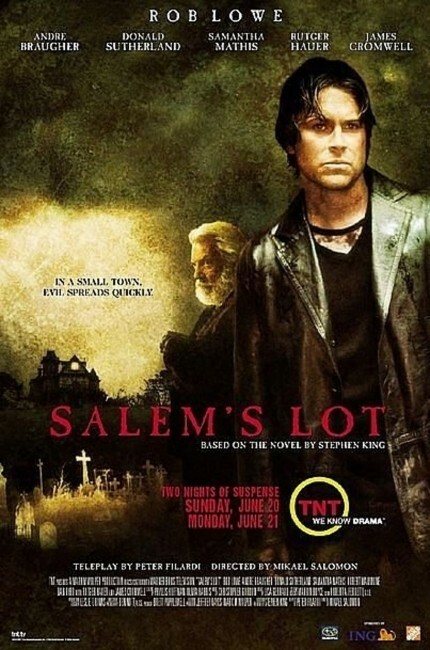 (Salem’s Lot was in fact the second book that Stephen King ever published). The book had earlier been adapted as a tv mini-series with Salem’s Lot (1979) from director Tobe Hooper, which is generally well-regarded. This mini-series was also released in a condensed theatrical version and there was a further spin-off in Larry Cohen’s video-released film A Return to Salem’s Lot (1987), which has nothing to do with the Stephen King novel or the mini-series other than featuring a town filled with vampires. 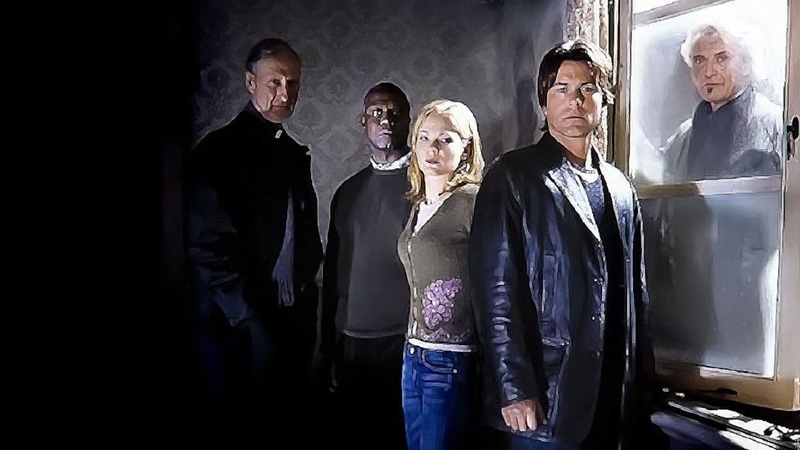 ‘Salem’s Lot 2004 emerges as a spate of tv works (usually mini-series) in the 1990s/00s that have adapted and in many cases remade earlier Stephen King works. Other of these King remakes have included The Shining (1997), Trucks (1997), The Dead Zone (2001-2), Carrie (2002), Firestarer Rekindled (2002) and Children of the Corn (2009). A host of other Stephen King works have also been adapted for television during this time. (See below for a complete listing of Stephen King screen adaptations). ‘Salem’s Lot 2004 was directed by the Danish-born cinematographer Mikael Salomon. After emigrating to the US in the 1980s, Salomon plied his cinematographic trade on A-list films like The Abyss (1989), Steven Spielberg’s Always (1989), Arachnophobia (1990) and Ron Howard’s Backdraft (1991) and Far and Away (1992). Salomon made his directorial debut on the coming of age drama A Far Off Place (1993) and went onto the disaster movie Hard Rain (1998) and various other works mostly for television, including genre works like Aftershock: Earthquake in New York (1999), the Dean R. Koontz adaptation Sole Survivor (2000), two episodes of a further Stephen King mini-series Nightmares & Dreamscapes: From the Stories of Stephen King (2006), the remake of The Andromeda Strain (2008), The Lost Future (2010), the remake of Coma (2012) and a further Stephen King adaptation Big Driver (2014). Screenwriter Peter Filardi had previously written genre films like Flatliners (1990) and The Craft (1996) and wrote/directed Ricky 6 (2000) about true-life Satanists. 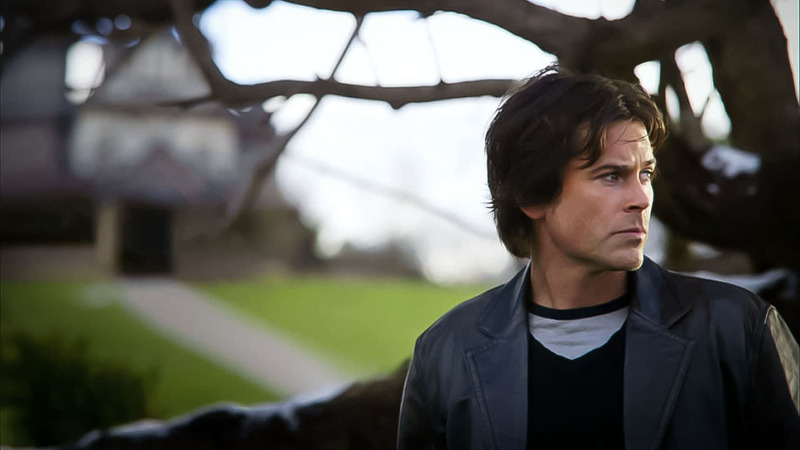 Peculiarly, the mini-series was shot in Australia, which, as locations go, seems about as far away from the mini-series’ setting of a winter-laden Maine small town as it is possible to get. While Salem’s Lot 1979 stripped the Stephen King novel down to a series of directorial set-pieces, Peter Filardi’s script here is an improvement. Indeed, Filardi aims for an impressive degree of literacy, particularly when it comes to Rob Lowe’s voiceovers. Filardi taps into a darkness beneath the facade of small towns that was never there in the Stephen King novel. King is generally amiable and laidback about smalltown values and accepting of most of the characters – but here many of the characters like Larry Crockett and Sandy MacDougall are given a much less pleasant spin than they had in the novel. Peter Filardi also abandons most of the secondary characterisations that Stephen King wrote – he keeps the names but writes new people into them – Ben Mears now becomes a Gulf War (I) veteran haunted by his experiences, which he has used as the basis of his first novel; Dud Rogers is the town gimp who has an unrequited and impossible longing for Crockett’s daughter; Sandy MacDougall is a battered trailer park housewife who is drawn into having an affair with the new character of one of the town’s doctors before this is revealed to be a scheme to defraud the doctor (one of the remake’s less satisfying plot twists); Charlie Rhodes is a burned-out Vietnam Vet who drives the school bus with an authoritarian military discipline; Ben Mears and Susan Norton have had a prior relationship via email correspondence. Filardi makes one or two interesting updates – in a reflection of changing values, Andre Brauhger’s teacher Matt Burke is now gay (and the mini-series certainly plays with an unmistakeable undercurrent of homosexual longing when Braugher takes ailing ex-student Christopher Morris back to his house). At least, ‘Salem’s Lot 2004 is much closer to the spirit of Stephen King than the 1979 version in the sense that Peter Filardi spends more time getting inside the heads of the people that inhabit the town (a regular trait of King’s works). Filardi takes his time building to the main thrust of the action – it is 70 minutes in before we even get to see a vampire. Filardi also makes Ben Mears returning to his hometown to confront his childhood fears a much stronger aspect of this mini-series than it was in the original novel and certainly in the 1979 mini-series. Indeed, the idea of childhood fears and returning to confront these swims over the mini-series with an exceptional metaphorical strength. There’s a striking flashback scene where the young Ben sneaks into the Marsten House and sees the wife shooting Hubie and then her dying in the bath with a shotgun blast to the chest while he remains on the floor paralysed with fear and unable to raise himself to save her. The 1979 Salem’s Lot often seemed arranged around a sequential series of directorial highlights. Mikael Salomon revisits many of these – there’s the brother floating up outside Mark Petrie’s window before being driven away by a crucifix; the scene where the grave is being filled and the kid returns to life; the scene where the angry husband walks in with a shotgun on his wife and another man in bed together (although this is placed in a different context). There is a repeat of the scene when Marjorie Glick gets up off the morgue table and is dispatched with a crucifix made of spatulas – however, Mikael Salomon ruins this by blowing it up into a big effects scene with the addition of a silly effect where she takes off and flies up to the roof, dropping her gown and leaving a scorched burn mark on the ceiling. Mikael Salomon comes up with one or two decent original shocks of his own. There is a startling one early in the show (which is neither in the original mini-series or the book) – indeed the first death we see – where an unseen figure jumps out of the woods and shoves the kid down through the fishing hole in the ice and leaves him to drown. It comes with such an unexpected jolt that it makes one sit up and pay attention. There is also a fine scene where Rob Lowe is in a jail cell and is taunted from the neighbouring cell by Todd MacDonald who starts delving into Lowe’s childhood memories and then begins squeezing his body into the minuscule air vent between the cells to come after him. To its detriment, ‘Salem’s Lot 2004 has become much of an effects-heavy vampire film with silly effects where the vampires take off into the air when they are staked. Certainly, the 1979 version is the much stronger as a pure scare-show. On the other hand, ‘Salem’s Lot 2004 is not entirely unworthy – the remake’s script has travelled into much more interior places and plays out as a psychological horror story far more than it is concerned with outward physical shocks. There are some very nice pieces of writing and characterisation in this version. The casting this time is a more variable prospect. The casting in Salem’s Lot 1979 was superb, featuring a great performance from James Mason who stole the show as Straker. In the role of Ben Mears, Rob Lowe is a much better actor than the wooden David Soul was in the original. On the other hand, Donald Sutherland is a disastrous replacement for the late, great James Mason. Sutherland is simply far too cuddly in the role of Straker. There is none of James Mason’s dry, almost absent-minded threat. Indeed, the threat that Donald Sutherland exhibits during the scenes chasing Samantha Mathis and Daniel Byrd through the Marsten House comes out as laughable. 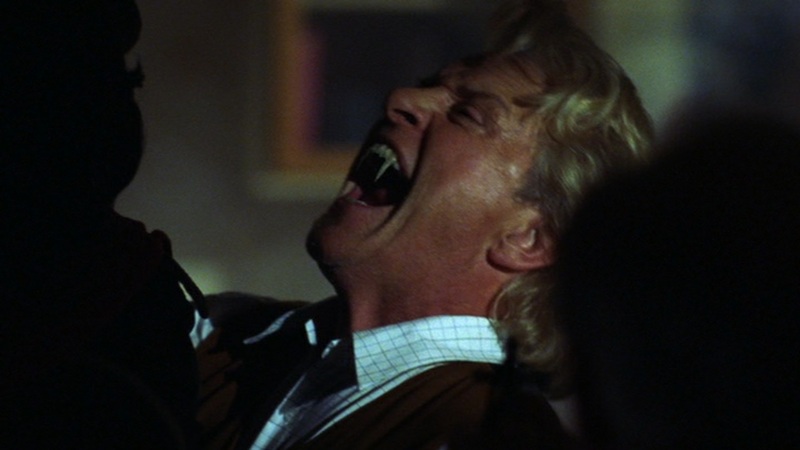 Rutger Hauer’s Barlow has the distinction of getting more lines of dialogue than he had in the 1979 mini-series, which takes him closer back towards the characterisation we saw in the book. Alas, the talking Barlow still does not get to say or do much and certainly never amounts to much of a threat. Another wasted character seems to be that of Andre Braugher’s Matt Burke. I think Andre Braugher is a highly underrated actor – I was a big fan of tv’s Homicide: Life on the Streets (1995-9) – but all that the mini-series does is place Braugher in a hospital bed for the bulk of the running time before abruptly killing him off. Other Stephen King genre adaptations include:- Carrie (1976), Salem’s Lot (1979), The Shining (1980), Christine (1983), Cujo (1983), The Dead Zone (1983), Children of the Corn (1984), Firestarter (1984), Cat’s Eye (1985), Silver Bullet (1985), The Running Man (1987), Pet Sematary (1989), Graveyard Shift (1990), It (tv mini-series, 1990), Misery (1990), a segment of Tales from the Darkside: The Movie (1990), Sometimes They Come Back (1991), The Lawnmower Man (1992), The Dark Half (1993), Needful Things (1993), The Tommyknockers (tv mini-series, 1993), The Stand (tv mini-series, 1994), The Langoliers (tv mini-series, 1995), The Mangler (1995), Thinner (1996), The Night Flier (1997), Quicksilver Highway (1997), The Shining (tv mini-series, 1997), Trucks (1997), Apt Pupil (1998), The Green Mile (1999), The Dead Zone (tv series, 2001-2), Hearts in Atlantis (2001), Carrie (tv mini-series, 2002), Dreamcatcher (2003), Riding the Bullet (2004), Secret Window (2004), Desperation (tv mini-series, 2006), Nightmares & Dreamscapes: From the Stories of Stephen King (tv mini-series, 2006), 1408 (2007), The Mist (2007), Children of the Corn (2009), Everything’s Eventual (2009), the tv series Haven (2010-5), Bag of Bones (tv mini-series, 2011), Carrie (2013), Under the Dome (tv series, 2013-5), Big Driver (2014), A Good Marriage (2014), Mercy (2014), Cell (2016), 11.22.63 (tv mini-series, 2016), The Dark Tower (2017), Gerald’s Game (2017), It (2017), The Mist (tv series, 2017), Mr. Mercedes (tv series, 2017– ), 1922 (2017), Castle Rock (tv series, 2018– ) and Pet Sematary (2019). Stephen King had also written a number of original screen works with Creepshow (1982), Golden Years (tv mini-series, 1991), Sleepwalkers (1992), Storm of the Century (tv mini-series, 1999), Rose Red (tv mini-series, 2002) and the tv series Kingdom Hospital (2004), as well as adapted his own works with the screenplays for Cat’s Eye, Silver Bullet, Pet Sematary, The Stand, The Shining, Desperation, Children of the Corn 2009, A Good Marriage and Cell. King also directed one film with Maximum Overdrive (1986).